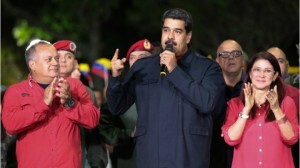 CARACAS - Venezuelan authorities have arrested 131 people accused of attempting to sabotage reforms implemented by President Nicolas Maduro to alleviate a crippling economic crisis, the attorney general said on Thursday. Tarek William Saab said the arrests included "several managers of large chains" accused of "speculating and hoarding basic products" that are subject to prices fixed by the government. The detainees are accused of trying to "destabilize the economy," Saab added. Of those arrested, 29 have been permitted conditional release and 10 others exonerated. Maduro has launched a raft of reforms aimed at ending four years of recession and arresting hyperinflation the International Monetary Fund predicts will reach one million percent this year. One of those policies was to fix prices on 25 basic products, including beef, chicken and eggs, all of which have since disappeared from supermarket shelves. The socialist government says the prices were agreed following talks with businesses and took into account production costs, but the Consecomercio trade union insists that only 35 companies were consulted and they did not represent the whole sector. Shortages have forced hundreds of shops to close. "Some merchants and businessmen made the decision to close, others are waiting to know the rules of the game that will govern us from now on," Consecomercio president Maria Uzcategui told AFP. Even before the uncertainty caused by Maduro's measures, 40 percent of shops had closed this year, according to Consecomercio. Meanwhile, people have been leaving Venezuela in droves: 1.6 million since 2015, according to the United Nations. The exodus has created a migration crisis in other South American countries, particularly Colombia, Ecuador, Peru and Brazil. Industrial output has dropped to just 30 percent while oil production is at a 30-year low of 1.5 million barrels a day, according to OPEC, way down from its record high of 3.2 million 10 years ago. Maduro's reforms included hiking the minimum wage by 3,400 percent and removing five zeros from the currency, which was also devalued to the tune of 96 percent and fixed to the value of Venezuela's largely discredited cryptocurrency, the petro. There's also been an increase in value added tax (VAT) and reduced petrol subsidies - Venezuelans pay the lowest prices in the world for fuel. An extra levy has also been slapped on remittances sent home from expats, while banks have been ordered to adopt the petro as a unit of account.